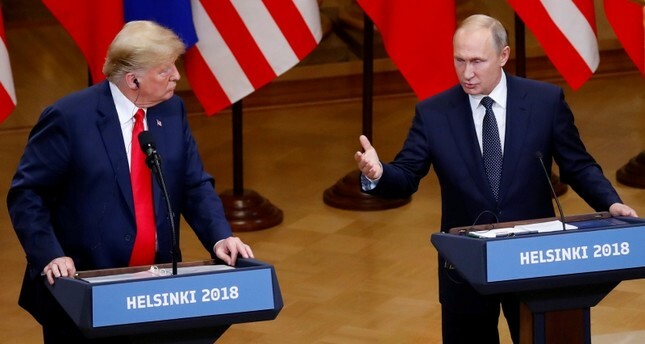 Standing next to Russia's Vladimir Putin, President Donald Trump openly questioned his own intelligence agencies' conclusions that Moscow was to blame for meddling in the 2016 U.S. election to Trump's benefit and seemed to accept Putin's insistence that Russia's hands were clean. Putin said he did indeed want to Trump to win — because of his policies — but took no action to make it happen. "I have great confidence in my intelligence people, but I will tell you that President Put was extremely strong and powerful in his denial today," said Trump, repeatedly denouncing the special counsel investigation into Russian interference efforts, which intelligence officials warn are ongoing. "I don't see any reason why Russia would interfere in the 2016 election,' Trump said. Putin, for his part, said for the first time that he did want Trump to win the election, but insisted he had not interfered and never would in American elections. It was an extraordinary press conference closing out the Trump-Putin summit, in which the American president delivered what amounted to a warm embrace to the man who for years has been isolated by the U.S. and Western allies for Russia's activities in Ukraine, Syria and beyond. Trump said he and Putin "spent a great deal of time" discussing allegations of Russian election meddling as they met for several hours Monday. But Trump declined the opportunity to denounce Putin for the interference efforts, which U.S. intelligence agencies insist did occur, including hacking of Democratic emails, the subject of last week's indictment of 12 Russians. Trump said, as he has countless times, that there was "no collusion" between his campaign and the Russians. "We ran a brilliant campaign and that's why I'm president," he said. Putin also suggested Monday that Moscow and Washington could jointly conduct criminal investigations into a dozen Russian intelligence officials accused of hacking during the 2016 U.S. election campaign — an idea Trump hailed as an "incredible offer." Asked if Russia could extradite the 12 Russian military intelligence officers, Putin challenged the U.S. to take advantage of a 1999 agreement envisaging mutual legal assistance. He said the agreement would allow U.S. officials to request that Russian authorities interrogate the 12, adding that U.S. officials could request to be present in such interrogations. Putin noted that Russia would expect the U.S. to return the favor and cooperate in the Russian probe against William Browder, a British investor charged of financial crimes in Russia. Browder was a driving force behind a U.S. law targeting Russian officials over human rights abuses. The summit began just hours after Trump blamed the United States — and not Russian election meddling or its annexation of Crimea — for a low-point in U.S.-Russia relations. The Russian foreign ministry responded by liking Trump's tweet and then replying: "We agree." Asked about the tweet and whether he held Russia responsible for anything, Trump said he held "both countries responsible" thinks the United States has been "fooling" and that "we're all to blame." "The probe in a disaster for our country. There was no collusion at all." Putin, speaking through an interpreter, once again denied what he described as "so-called interference of Russia." He called it "nonsense" and insisted the Russian state had never interfered and would never interfere in the American electoral process. The pair had opened their long-awaited summit Monday with a wink and slouch, respectively, then talked one on one behind closed doors for two-plus hours before the American leader declared their meeting was off to a "very, very good start for everybody." The summit, which is being closely watched around the world, was not the first time Trump and Putin have held talks. They met on the sidelines of world leader meetings in Germany and Vietnam last year. But Monday's session was condemned in advance by members of Congress from both parties after the U.S. indictment last week of 12 Russian military intelligence officers accused of hacking Democrats in the 2016 election to help Trump's presidential campaign. Addressing reporters before the one-on-one meeting, Putin struck a casual pose during Trump's remarks, slouching in his chair with his legs wide and eyes low. He nodded along to some of Trump's remarks before they were translated, showcasing his fluency in English. Trump leaned forward in his chair, his hands tented in front of him and frequently glanced over at the Russian president. At one point, he shot Putin a wink. After Trump concluded his remarks, American reporters shouted several questions about whether he would bring up election meddling during his discussions with Putin. Trump did not respond; Putin appeared to smirk. With that, the leaders gave a quick handshake and their private meeting in the opulent Gothic Hall was underway — the two of them, each with a translator. Out on the streets, the summit attracted a grab-bag of protesters, with abortion-rights activists wearing artificially bulging bellies and Trump masks, anti-fascist protesters bearing signs with expletive-laden insults, and free traders, anti-war Ukrainians and gay rights supporters making their voices heard.